Decadent French toast drizzled with maple syrup is the quintessential Sunday brunch. The only problem is the boatload of calories, fat and sugar…yikes! Instead, order this worth-waking-up-for breakfast treat in your own kitchen this weekend, complete with caramelized apples and whipped cream. Liberally coat a skillet with oil spray (canola or vegetable oil) and heat over medium flame. Add the butter, and once it’s melted, add the apple, cinnamon, and maple syrup. Stir to combine. Lower the heat and sauté the apples until they are cooked and gooey, about 7 minutes. Add the vanilla extract with about 1 minute remaining. Stir to combine. Meanwhile, make the French toast. In a small bowl, whip together the egg, egg white, cinnamon, nutmeg and vanilla. Dunk and coat each bread slice in the egg mixture, and cook on the grill or skillet until golden brown, about 1 minute per side. 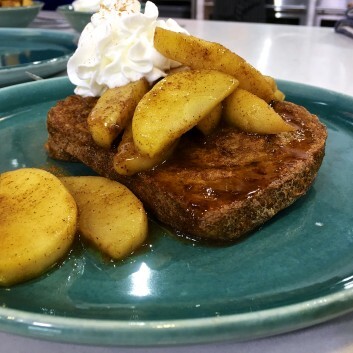 Top with caramelized apples, a dollop of whipped cream and dash of ground cinnamon!